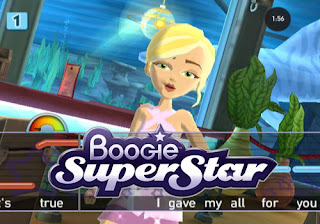 "Boogie SuperStar" - Electronic Art's latest game for the Nintendo Wii system is already announced. But instead of finding Prince Charming, the goal of the game is to beat rival players' singing and dancing skills to earn the grand title of Boogie SuperStar. Players are "discovered" and whisked away in a stretch limo to an island where they hone their skills for the competition. Electronic Arts created the game specifically for female teens. In the United States, 38 percent of all gamers are female, according to the Entertainment Software Association. Girls - and boys too - can choose their own character and customize its name, hairstyle and outfit for their performance. They then pick music from a playlist of Top 40 pop songs, including hits from Britney Spears, Leona Lewis and Kanye West. Unlike other popular music games such as "Rock Band" and "Guitar Hero," players of the new game dictate how their character or avatar moves on screen. The game includes a microphone that measures players' vocal fluctuations. The motion-sensing Wii controller records their dance moves. Another upcoming girl-targeted game for the Wii, Sega's "Nancy Drew: The White Wolf of Icicle Creek," will also be released in October 2008 with "Boogie SuperStar." Analysts and critics in the gaming industry say both "Boogie SuperStar" and "Nancy Drew" Wii games are a positive step for video game publishers and will help double their consumer base.